CORFAC International 2013 President Bill Hawkins announced the addition of new commercial real estate affiliates in Canada, Belgium and Romania. 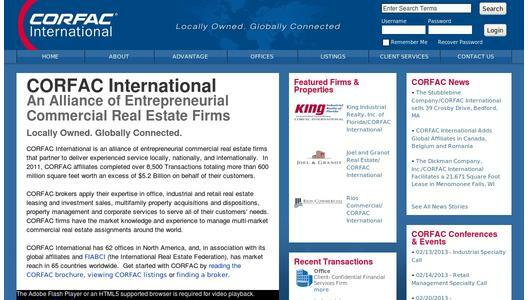 Corporate Facility Advisors (CORFAC) is comprised of privately held entrepreneurial firms and has 86 affiliated offices worldwide. Contact 703.532.6160 or www.corfac.com. Group Hugo Ceusters-SCMS/CORFAC International was established in Antwerpen, Belgium in 1946. Led by Executive President Ingrid Ceusters-Luyten, SIOR, Hugo Ceusters is organized into four operational business units: sales and leasing, business property negotiations, valuations/tenant representation and project management for office, retail, industrial, land and property management sectors. 'Group Hugo Ceusters-SCMS is the only family owned company playing in the 'Premier League' of the Belgian commercial real estate market. We believe in the strength of CORFAC network to empower the real estate services our clients want on an international level. Members of CORFAC that we know in Europe inspire confidence and professionalism,' said Ingrid Ceusters-Luyten. Visit www.ceusters.be. ESOP Consulting/CORFAC International was established in 2002 in Bucharest, Romania. The firm is led by General Manager Alexandru Petrescu. ESOP was the first Romanian company to specialize in providing high quality services to medium-size local and international companies in Romania. ESOP has the largest property database in Bucharest which enables them to concentrate on office leasing, office sales, industrial property owners and space occupiers. In addition, the company has an active residential real estate services business unit. 'In the first 11 years of activity, ESOP's aim was to become a reliable and trustworthy commercial real estate service firm on a local level, and we believe we achieved our initial goals. The next step for us is to connect to global markets and CORFAC International is the logical fit for our company as the international network of affiliated firms expands its presence in Europe,' said Alexandru Petrescu. Visit www.e-realtor.ro/. Shindico/CORFAC International, founded in 1975 in Winnipeg, Manitoba, is led by President Sandy G. Shindleman, CCIM, SIOR, MRICS. The company serves the capital of Manitoba along with other areas in the province and portions of neighboring Ontario. The firm specializes in retail, office, industrial and land property markets. Visit www.shindico.com.